Ready to apply for an IBA housing loan? First register your interest by completing the online Expression of Interest Form (application opens in a new window). To calculate your borrowing capacity, visit our Home Loan Calculator (application opens in a new window) or go to IBA Housing Loans to find out more about the loan products, deposit or interest rates. If you would prefer a printed copy of the Expression of Interest Form please contact us. 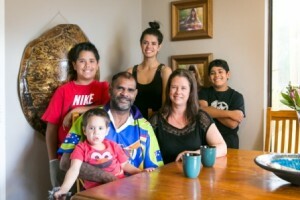 Read how Lee and Graeme Willis from Alice Springs are achieving their dream of home ownership. If you are eligible, your name will be added to the Expression of Interest register and you will be invited to apply for an IBA housing loan as funds become available. IBA will then ask you to submit a Housing Loan Application which will be used to determine whether you qualify for a loan and the amount you may be able to borrow. Depending on your circumstances, IBA may provide you with a loan that only covers part of the funds you need to buy a home. If this is the case, you will need to borrow the remaining funds to complete the purchase from another lender. If you apply for a housing loan through IBA, your personal credit history will be assessed. If you wish to know what information about you is held by the credit reference agency used by IBA, you can request a copy by visiting Equifax. meet other housing loan product criteria relevant to your home purchase. IBA housing loans are for purchasing a home to meet your family’s needs. For construction loans, the house being built must be of a suitable standard and will generally not include unnecessary extras, such as luxury fittings. IBA will not provide housing loans for purchasing investment properties or properties that may be used for business purposes, including hobby farms, bed and breakfast establishments or other commercial properties. We will only consider housing loans for off-the-plan purchases or the purchase of unregistered land, such as purchasing a brand new home or unit before it is built, if the purchase can be completed within a six-month period.